Everyone has been asking for this recipe after I showed it on instagram a couple of times over! Chewy, crispy and so completely delicious, no one will ever know that they are made with no dairy or eggs and are gluten-free!!! YOU GUYS, these have been the most popular cookie I have ever made IRL- all my friends and family are obsessed! So, one evening we decided that we would make a “Coco Cookie” and basically I emptied the pantry so that we could make whatever she wanted. She came up with almonds (shaved and slivered), butterscotch chips (I used vegan) and cinnamon and nutmeg. 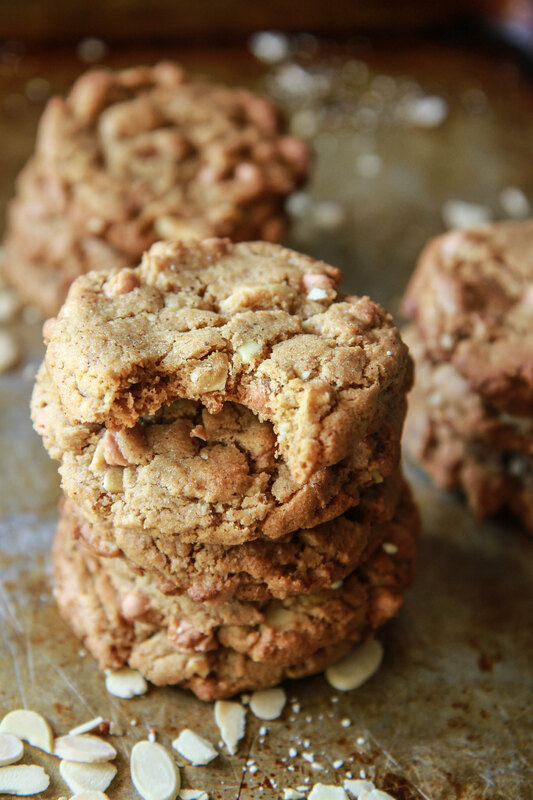 I added the generous amount of almond butter for texture, and now we have what is basically the most popular cookie recipe ever among friends and family. I have been bringing them to the office, a public speaking engagement, lots of family and friend gatherings and let me tell you, these cookies just don’t get old. In fact- I have to stop making them, because once I do, it’s like a sure thing that I am going to eat like 3-5 in a sitting. Even when I try to hide them from myself in the freezer, I just keep going back for more- it is SUCH a problem. A tasty problem. They are really good with an afternoon cup of coffee by the way! I bake them for 10 minutes and then smack them on the top with a spatula to deflate them and bake for another two minutes for chewy cookies and 3-4 minutes for crispy cookies. On the flavors (which are awesome as-is) you could add white chocolate chips, caramel chips and even chocolate chips or dried cranberries to this combo for added excitement! *A note on the butterscotch chips. I found non-dairy butterscotch chips on Amazon. I have found that the kosher brands do not add milk to theirs, so I stock up on them when I see them in stock! In the bowl of a standing mixer fitted with a paddle, cream together the vegan butter, brown sugar, vanilla, almond butter, salt, cinnamon and nutmeg and then cream together until fluffy. Sprinkle in the xanthum gum and add the flour and mix until well combined. Add the coconut milk and mix until you have a uniform dough. Add the butterscotch chips and the almonds and mix them in. Scoop the dough onto the prepared sheet pans and bake the cookies for 10 minutes at 350 degrees. I take them out at the 10 minute mark and smack the top with a spatula and then bake another 2 minutes for chewy, and 3-4 minutes for crispy cookies. I need to get my hands on one of these cookies!! Looks SO good! These cookies look fantastic! Can you remember the brand name for the dairy free butterscotch chips? Where do you get the dairy free butterscotch chips??? Never been able to find those. Are they certified dairy free? These cookies sound amazing! Can you clarify the measurement for the brown sugar? I’m assuming 1 1/2 cups, but it’s missing from the recipe. Thank you for sharing! Hi Jenelle- it is 1 1/2 cups, its listed as the second ingredient! Hope you like these! Hi Heather, I was on a trip to Africa (!!) when I read this recipe, got home last night and knew this would be the first thing I baked today. I was wondering if I could sub some coconut oil for some of the vegan butter, not sure how much of either one I’ve got on hand but was thinking of just combining what I’ve got to make 1/2 cup. What do you think? Also, I’ve been using Krusteaz GF flour and it is very gritty, I’ve tried sieving it and have gotten some grit and even pieces of rice left in the sieve. Still gritty though. Does Bob’s Red Mill have a grit issue? I really want to minimize the grit!